DIY - Pie In Face fundraiser! Norwood High School girls volleyball team in Dedham, Massachusetts, holds whipped cream pie throwing fundraiser on Norwood Day. For a small donation, $3 for one pie for $5 for two, folks could toss a pie in the face of their favorite volleyball player. The money will go towards the new uniforms just purchased for the varsity, JV A and JV B teams. Abilene, TX – It was a nice afternoon for some pie… in the face. 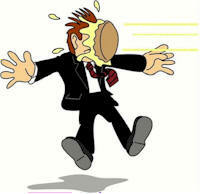 Tuesday the Zeta Chi Social Service Fraternity held their 3rd annual Pie-in-the-face Fundraiser. Students were able to buy a whipped cream pie and hit club members in the face with it. They are donating the proceeds to the Connecting Caring Communities. Last year the club raised $370 for the Children’s Hope Chest Foundation in Russia during the three-hour event. Kosciusko, MS – When it comes to Attala County’s Relay for Life, Kosciusko Lower Elementary has always been one of the leaders in fundraising for the American Cancer Society for the Kosciusko City School District. One KLE class competition is raising money to see which teacher and teacher assistant get a pie in the face. Canon Falls, MN – The Cannon Falls Ed Foundation’s annual hair dye contest has morphed into a “pie in the face” contest. A chance to throw a pie was auctioned off the night of the annual CFEF auction fundraiser. In the event of a tie, both Pie in the Face “winners” will get the pie. There are a number of “pie in face” videos on YouTube. 1. Pick a date for your event to take place. You will also need a location for the actual pie presentation to be done. We do it during the Summer festival, they actually let us use the stage to announce our winner. 2. Ask around your community for volunteers for this event. You want to pick the people that are very active in your community and ones that have a great personality. Some examples are: the Mayor, the Superintendent of a school, Principal, Football coach or even the Police Chief. You will need at least 5 people. Make sure they know what they are getting into. 4. We also take votes during the festival: Friday, Saturday and Sunday. We have a poster which we made that shows a big pig receiving a pie in the face at the top. On the bottom we made 5 little pigs and put the participants names on each one (one name per piggy). We then put fun tac or tape on the back of each one and move the pigs up as their votes come in. On Sunday afternoon we take down the poster, but still keep track of the votes. Only our group knows who is winning. This helps to get the other players to vote against each other because they knew where they were, but not where they are now. Some times we make our most monies off the participants.